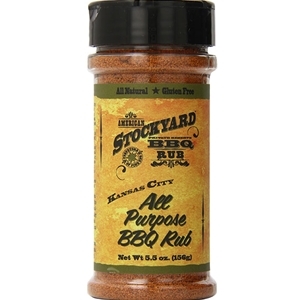 American Stockyard All Purpose BBQ Rub if you want to take weekend BBQ warriors to veteran pitmasters, the traditional Kansas City Style BBQ rub needs to be in your arsenal. The all-natural blend of brown sugar, paprika, hickory smoked salt and spices will turn your ribs, brisket, burnt ends or other BBQ creations into ribbon-worthy masterpieces. 5.5oz. Brown sugar, paprika, salt, spices, dehydrated garlic and onion, smoked paprika, silicon dioxide (added to prevent caking).